At Superior Roofing LLC, we offer roof coating products and service for many applications including commercial flat roof restoration, roof repairs, leak roof repairs and much more! Roof coatings can be an affordable alternative to full roof replacement. 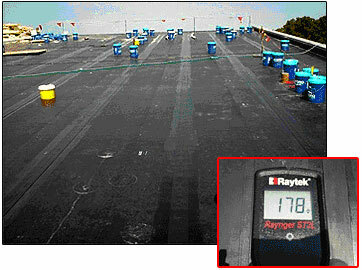 Roof coatings are also a great solution to hard to solve roof leak problems on flat roof areas. Roof coatings come in different colors with the most popular being white for its Energy Efficiency due to high UV reflective properties. Call us for more information and a roof consultation to see if it is the right solution for you. 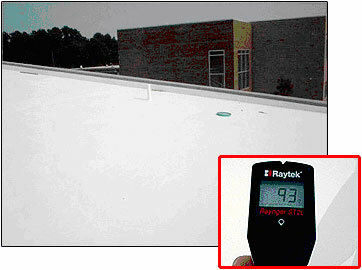 This is a typical Hot Roof where summertime temperatures can exceed 180 degrees F! PremiumCoat is one of the highest quality roofing and waterproofing systems available. This flexible, U.V. resistant elastomeric compound is fully reinforced with a tough nonwoven polyester fabric designed for all roofing and flashing applications. PremiumCoat is safe to handle and requires no special equipment to install. It provides a long lasting, energy efficient surface that when properly installed by a certified applicator provides a 10-year warranty. When managed through a proper maintenance schedule, the warranty can be extended every 10 years. The actual temperature of the roof at time of the inspection is 178 degrees F! Sustainable roofing system that saves expensive removal and disposal cost. Ultraviolet and Infrared resistant for added durability. High Albedo reduces heat and lowers energy costs. Resistant to acid rain and chemical pollutants. Won’t spread flame over noncombustible surfaces. 100% adhesion of system to substrate. Wide range of colors provides beautiful architectural finish. Meets V.O.C. emissions regulations to eliminate facility downtime during application. Nontoxic formulation is safe to install. No special equipment required to install. 10 year renewable warranty available for roofs, which means system never has to be torn off. 10, 15, 20 year renewable warranties available for qualified jobs.